On December 6, Venezuelans will go to the polls to elect a new parliament. The elections are taking place during a time of economic and political crisis in Venezuela. President Nicolás Maduro has been widely criticized for some of his strong-arm tactics, including jailing political opponents, while steep inflation and basic goods shortages threaten to wreak further havoc on the Venezuelan economy. 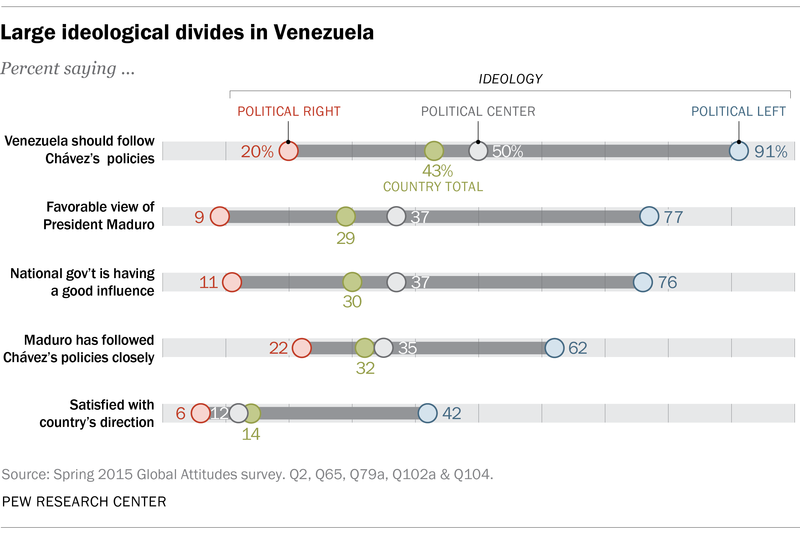 And while overall public opinion is down on Maduro and the state of the country, there are wide ideological splits that point to a nation divided. Venezuelans on the political left are consistently more supportive of government policies, more positive on Maduro and less concerned about major problems affecting the country compared with people on the political right. The left-leaning are also more keen to follow former President Hugo Chávez’s policies and want Maduro (who was vice president under Chávez) to do the same. And people on the political left are more positive about the direction of the country. Still, fewer than half on the left say the country is on the right path. Overall, ratings for Maduro are poor. Majorities disapprove of his handling of every national issue tested, including crime, corruption and relations with the United States. But while 68% of Venezuelans have an unfavorable opinion of Maduro, they are not fond of the opposition leaders either. An overwhelming 85% of Venezuelans are dissatisfied with the way things are going in their country. In 2013, just after Chávez’s death, dissatisfaction with the country was at 57%. In addition, Venezuelans are very concerned about the economy, especially rising prices, lack of jobs and shortages of basic goods. A majority of Venezuelans also have negative perceptions about major national institutions, such as the government, military and court system, though they still share faith in the media. Meanwhile, Chávez’s legacy continues to loom. When asked whether their country should follow Chávez’s policies, 43% of the public says yes, while just about half (52%) say that Venezuela should not follow his policies. These are among the major findings of a newly released Pew Research Center survey conducted in Venezuela from April 6 to May 6, 2015, among a nationally representative sample of 1,000 adults. All interviews were conducted face-to-face. Fully 85% of Venezuelans are dissatisfied with the direction of the country, up 28 percentage points from a 2013 poll conducted shortly after the death of Hugo Chávez. Currently, only 14% are satisfied with the way things are going in Venezuela. Venezuelans ages 50 and older are slightly more positive (21%) compared with the 8% of 18 to 29 year-olds who are happy with the country’s situation. And those on the political left (42% satisfied) are much happier with the state of the nation than those on the political right (6%). When it comes to top concerns in Venezuela, the list of problems is long and daunting. The foremost issue, and one that has plagued the country for years, is inflation. Roughly nine-in-ten (92%) say that rising prices are a very big problem. Inflation in Venezuela is the highest in the world, and is estimated to be well over 100%. The next most concerning issues are also economic – lack of job opportunities (85% very big problem) and shortages of basic goods (84%). The lack of basic goods is partially on account of the high inflation rate. Other serious issues also rank high among Venezuelans: Roughly seven-in-ten or more say that crime, public debt, health care, corrupt political leaders and poor quality schools are very big problems. In fact, worries about health care and poor quality schools have increased in just the past year (up 15 and 14 percentage points, respectively). Many people also say that inequality (56%) and traffic (51%) are significant problems, with intense concerns about traffic increasing 13 points since 2014. For most of these issues, people who consider themselves on the right of the political spectrum are more concerned than those on the left. In other words, people who are more likely to follow Maduro’s left-wing United Socialist Party of Venezuela (PSUV) are less concerned about these national issues. Still, majorities on the right and left say most of these issues are very big problems. On a separate question, when asked which economic issue is most important for the government to address first, 47% of Venezuelans say rising prices should be the top priority. Around two-in-ten say lack of jobs is the top economic issue, with only 9% naming public debt and 1% saying inequality. About a quarter (24%) volunteer that all are top priorities. Since 2013, there has been a 10-percentage-point increase in those naming inflation and a 10-point decrease in those Venezuelans choosing unemployment, once again pointing to the seriousness of the inflation issue. When it comes to where to place the blame for the dreary economic situation, Venezuelans are divided. Roughly equal shares name the government’s economic policies (46%) and falling oil prices (43%). Only 6% pin domestic economic woes on the U.S. When asked about major national institutions in Venezuela, there is a clear consensus that government-run organizations are having a bad influence on the country. 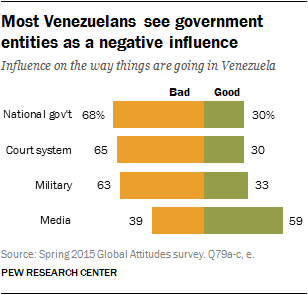 More than six-in-ten say the national government (68%), the court system (65%) and the military (63%) are having negative influences on the way things are going in Venezuela. The media, such as television, radio, newspapers and magazines, is the most respected institution tested, with 59% of the public saying it is having a positive influence on the country. Since last year, all of the national organizations tested have seen declines in the number of people saying they are having a good influence on Venezuela. This includes a 12-percentage-point decline in the share saying the national government has a positive influence on the country, and 10-point declines each for the court system, the military and even the relatively well-liked media. For all government-run organizations tested, those on the left of the political spectrum are more likely to describe them as a good influence on Venezuela compared with those on the political right. For example, 76% of those on the left say that the national government is having a good influence on Venezuela, while only 11% on the right say the same. There is also a slight education gap on the influence of national institutions, with Venezuelans who have less than a secondary education showing slightly more positive opinions of each of the institutions tested compared with more educated Venezuelans. 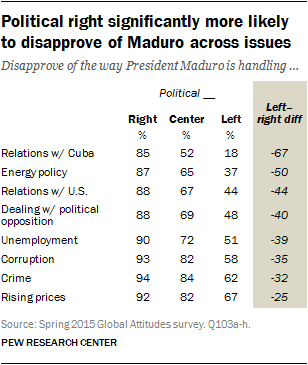 On balance, Venezuelans have an unfavorable view of President Maduro. Two years after being voted into office in a special election following Hugo Chávez’s death, Maduro receives only a 29% favorable rating, compared with 68% voicing an unfavorable view. However, opposition party leaders do not fare much better. Henrique Capriles, the current governor of Miranda and leader of the Justice First party, also receives a low 36% positive rating, and a majority views him unfavorably (56%). Similarly, Leopoldo López, founder of the Popular Will party, receives just a 36% favorable review from the Venezuelan people, with a majority (55%) offering a negative review. There are sharp ideological divides when it comes to views of these leaders. Maduro garners a 77% favorable rating from Venezuelans identifying themselves as on the left of the political spectrum, while just 9% of those on the right see him positively. Conversely, López and Capriles receive much support from the ideological right (64% and 65% favorable rating, respectively). Roughly seven-in-ten or more also give Maduro negative ratings on handling of relations with the U.S. and energy policy. And 63% disapprove of his handling of relations with Cuba. Ideological divides exist on Maduro’s management of all the issues tested. The biggest difference in ratings between those on the right and left are on his dealings with Cuba: 85% on the right disapprove, while only 18% on the left say the same. Gaps are also large on disapproval of his handling of energy policy (-50 percentage points), relations with the U.S. (-44 points) and dealing with political opposition (-40 points).